Paris — The spate of anti-Semitic violence in Europe might appear to justify Israeli Prime Minister Benjamin Netanyahu’s call for European Jews to move to Israel where, he claims, Jews can be safe. Europe’s Jewry should nevertheless reject Netanyahu’s call. It’s a populist ploy ahead of Israel’s March 17 election. Jewish citizens in Europe should instead be active participants in the societies in which they live, continuing to promote democracy, civil liberties and tolerance of diversity as they have done energetically in the past, to Europe’s enormous benefit. Nowhere, even in long-established democracies such as France, can the liberal order be taken for granted. Every generation has to fight anew to maintain (or even, in a best case scenario, improve on) the quality of democracy as its circumstances change. Anti-Semitism is one challenge to this struggle, Islamophobia another. The two illiberal ideologies and their implications for open societies are more closely linked than they appear. Anti-Semitism is on the rise across Europe, propelled by familiar and new antagonists. The Jan. 9 shooting of four Jewish shoppers at a kosher supermarket in Paris followed a string of lethal assaults on Jews across the continent in 2014. 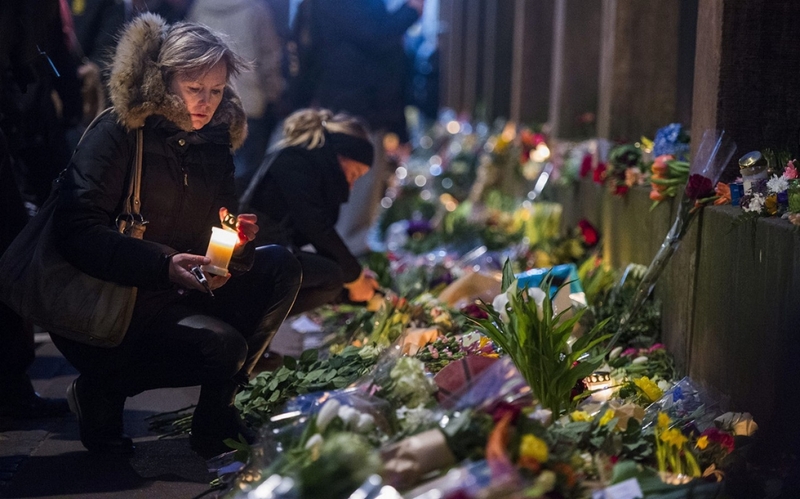 Last month an attack on a synagogue in Copenhagen, Denmark, left one man dead and two police officers wounded. The incident forced Jewish schools in Belgium and France to close temporarily. Last year the Jewish Museum in Brussels was bombed. At least eight synagogues were attacked in Europe in July 2014. In Germany, Jewish men wearing the skullcap, or kippa, were harassed, cursed and beaten up on the street. A 2012 European Union survey of 6,000 Jews in eight European nations, which together account for 90 percent of Europe’s Jewish population, found that 66 percent believed anti-Semitism was on the rise in Europe; 76 percent said anti-Jewish sentiment increased in their country since 2007. In a survey a year later, almost half of the respondents said they were concerned about being verbally insulted or attacked in public. Seventy years after Auschwitz’s liberation, which is being commemorated across Europe, Jewish graves have been desecrated, and Jewish citizens are uncomfortable in certain neighborhoods, particularly those with high proportions of Muslims. Anti-Semitism is not a new phenomenon in postwar Europe. But its usual standard bearers were Europe’s far-right groups. Far-right and populist groups still propagate hatred toward Jews, although in its more muted form than in recent decades. (There’s an anti-Semitic stripe in the far left as well, closely linked with anti-Americanism and sympathy for the Palestinian quest for statehood.) Parties such as the National Front in France, Austria’s Freedom Party and Belgium’s Vlaams Bok have long traded in anti-Semitism. Opinion polls show residual anti-Semitism in most European populations, which is largely understood as a reaction to globalization, modernity and urban values. In Central and Eastern Europe, where there was no postwar reconciliation, anti-Semitism burns hotter as part and parcel of old-school volkish nationalism. Muslim leaders have to fight anti-Jewish mindsets as actively as Europe’s Jews must help dispel the falsehoods fueling the anti-Islam discourse. But the far-right anti-Semites now have a more opportune target: Islam. The same tools and tropes that were once used to create fear of and resentment toward Jews have been turned against Muslims. They claim that Muslims are swamping their countries and diluting their national cultures — claims once made against Jews. Whereas Jews were claimed to partake in blood rituals, Islam is cast as an inherently violent religion and all Muslims as threats to European security and identity. Germany’s PEGIDA movement, which took to the streets in Dresden and elsewhere in Germany in late 2014 and early 2015, offers a perfect example. While PEGIDA’s foremost target was the Muslim community, its closeness to neo-Nazi groups and anti-Israel currents was manifest. One man with an Israeli flag was chased from a PEGIDA demonstration, and marchers carried posters reading “Just say no to Israel” and “Let Germany finally be Germany,” the latter a resentful reference to Germany’s war guilt and coming to grips with the Holocaust. Just as contemporary anti-Semitism is often strongest in places with no Jews, PEGIDA support was the highest in Dresden, a city with a population less than 0.5 percent Muslim. In other words, as with anti-Semitism, Islamophobia is highly irrational. The chief perpetrators of anti-Semitic violence and terrorist attacks, however, are not the far right ideologues but radicalized elements in Europe’s Muslim community. It goes without saying that not all Muslims are anti-Semitic. (Collective guilt is almost always wrong-headed.) But polls show that anti-Semitism is strikingly high among European Muslims, particularly younger Muslim men and women. A recent French survey found that 74 percent of French Muslims said they believe Jews have too much influence over the nation’s economy. (The figure among non-Muslim French was 25 percent.) Seventy percent of French Muslims said that Jews control the country’s media. A 2013 study by the EU found that Jews in Europe felt most threatened by Muslims in their societies. Günther Jikeli in his new book, “European Muslim Antisemitism,” corroborates these findings and argues that anti-Semitism is pervasive in the beliefs of young European Muslims. The reasons for the new anti-Semitism are part socioeconomic, part political. So far, the young Muslims involved in the recent attacks against Jews have almost always been the kind of poor, disenfranchised young men whose circumstances breed resentment and anger. In Islam they find a home and identity. The politics of Israel in the Middle East have thrown fuel on the fire consistently over the last two decades; the ongoing violence against the Palestinians in Gaza is only the most recent agony. The emergence of the Islamic State in Iraq and the Levant has facilitated the mix of a toxic cocktail that targets Jews across Europe. But Jews are not necessarily safer in Israel than they are on the streets of Paris or Berlin. Europe is facing an enormous challenge in reacting to this new element in its midst and defeating it without encouraging more converts to radical Islam. We saw this happen in the aftermath of United States’ wars in Afghanistan and Iraq, in response to the Guantánamo Bay detention facility, the Abu Ghraib prison scandal, the Central Intelligence Agency’s black sites and the drone strikes in Pakistan, Yemen and Somalia. On Feb. 14, the European Jewish Congress called for enhancing existing anti-racism legislation, which is enshrined in the European Convention on Human Rights. It envisions prohibiting the wearing of the full-face veil everywhere in Europe, punishing denial of the Holocaust and hate speech and outlawing praise for a terrorist act. But the proposal is not constructive in the long run. Such measures cast suspicion on all Muslims and would work to alienate rather than integrate. European countries must devise a way to make Muslims feel part of their societies. Here in Paris it is stunning to experience firsthand how abruptly the City of Light ends at the banlieues, the tenement housing on Paris’ periphery where much of the migrant population lives. Here one leaves the urban wonderland of museums, fine restaurants, graceful apartment buildings and good jobs and enters the underworld of poverty, marginalization, unemployment and ugliness. There are many ways that French and other European societies can reach out to their Muslim neighbors. This could mean interfaith dialogue, common civic initiatives, integrated schooling and more inclusive governance structures. Projects such as Germany’s Schule Ohne Rassismus, a nonprofit that fights racial bias against Jews, Muslims and others in secondary schools across the country should be replicated elsewhere in Europe. Ultimately, all Europeans, including Muslim communities, must insist on more democracy, civic culture and tolerance. Muslim leaders have to fight anti-Jewish mindsets as actively as Europe’s Jews must help dispel the falsehoods fueling the anti-Islam discourse. This is the way to beat the twin menaces of anti-Semitism and Islamophobia.